On May 27, the 2017 Track & Field season came to a close with Olivia Carter capturing 3rd place in the Division 2 CIF San Diego Track & Field Finals. Her time of 15.27 in the 100m hurdles was a personal best, a school record and tied her for 6th overall out of the 18 combined D1 and D2 competitors. Olivia's track career concluded with her owning school records in the long jump, 100m hurdles, and as part of the school record-setting 2014 4 x 100 relay team. 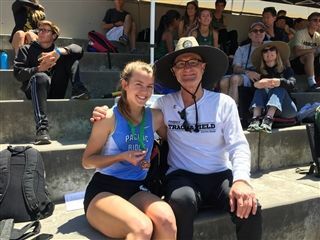 Olivia ran her best races this year when it counted - setting new school records each week over the last three weeks of the season in League Finals, CIF Prelims, and CIF Finals. Congratulations!